As kids spend more time indoors on digital devices, it can be a challenge finding ways to get them to play outside. When you make outdoor playtime a habit early-on, they’re far more likely to seek outdoor entertainment. What’s more, instilling a sense of well-being with the outdoors makes it easier to get them to with outdoor chores as they get older. If there’s anything more guaranteed to bring children hours of fun outside than a sandbox, parents haven’t found it. 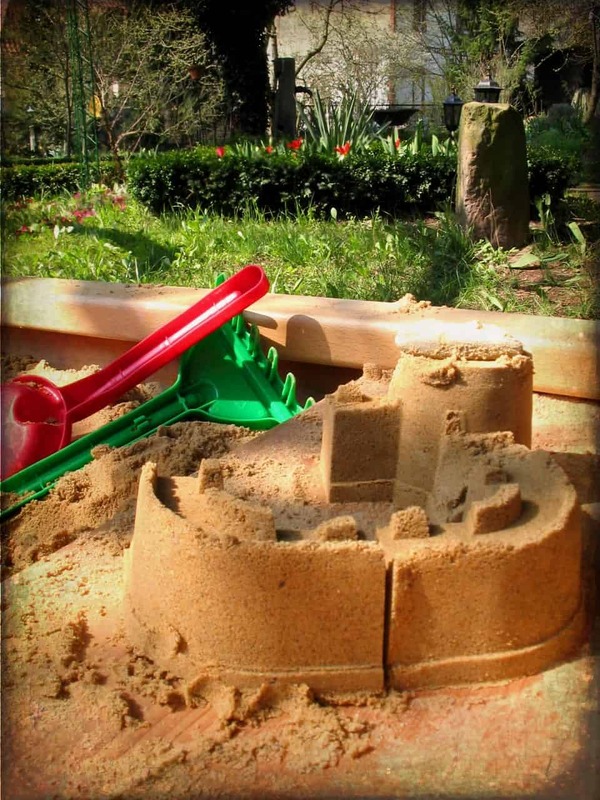 We all remember the hours of playtime sifting sand and building sandcastles. Pediatricians say sand-play is also therapeutic and helps teach children important fine motor skills. 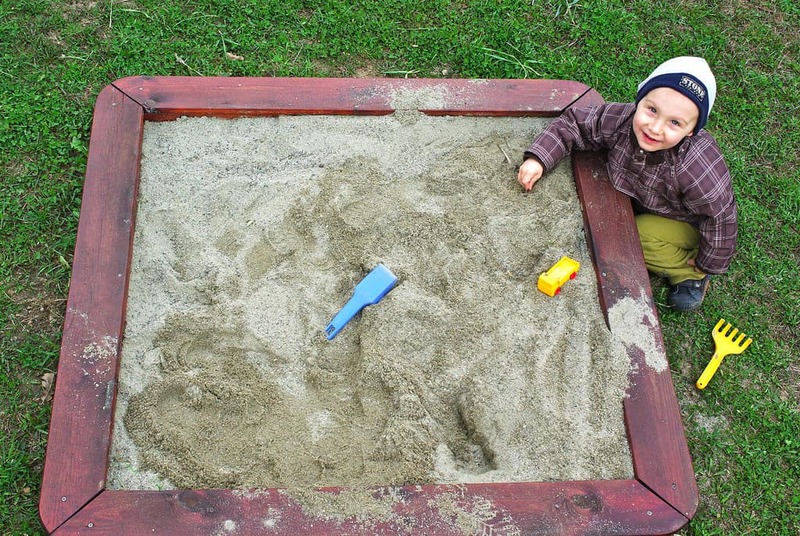 With a little effort, you can recreate this classic playscape in your backyard using our guide for your DIY sandbox. The first thing you must do is determine what size sandbox you want. It’s helpful to build in lengths that can be made by cutting dimensional lumber in half, so there’s no waste. If you don’t have a circular saw, someone at the home improvement store can cut your lumber for you. A comfortable size for two to three children is a four feet square. 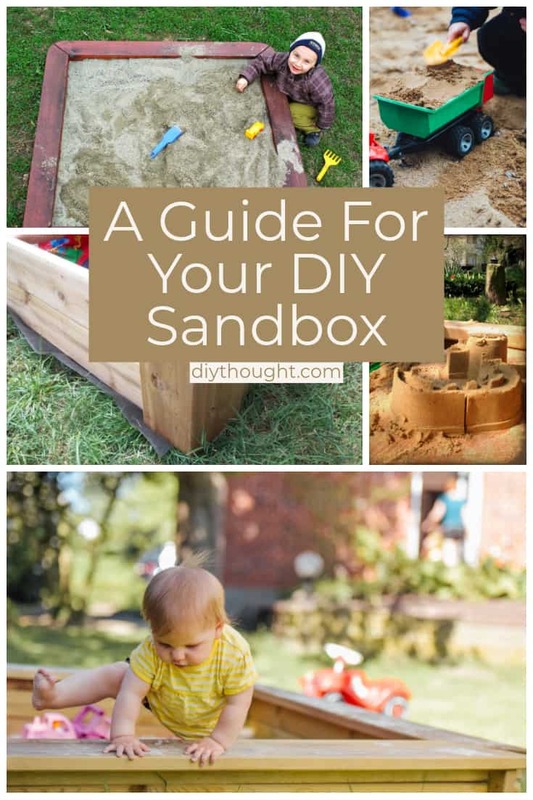 Because a sandbox is essentially a frame filled with sand, this is the most crucial step. You can use 2 x 8 pressure-treated lumber from your home improvement store, connected with three-inch decking screws (three on each end.) Be sure to reinforce the frame with a wooden or metal L bracket in each corner. Your best bet for a bottom is to build it with 1′ x 4 ‘slats. They are thin and easy to cut with a handsaw, so even if you don’t have a power saw, you should be able to make short work of them. If you make a box that’s four feet wide, you should be able to cut eight-foot slats in half to get the lengths you need. Cut your slats and lay them across the frame with half an inch of space between them. Screw them in and then turn your box so that it is right side up. You can construct a cover using 1′ x 4′ slats. These should be the same length as the bottom slats. 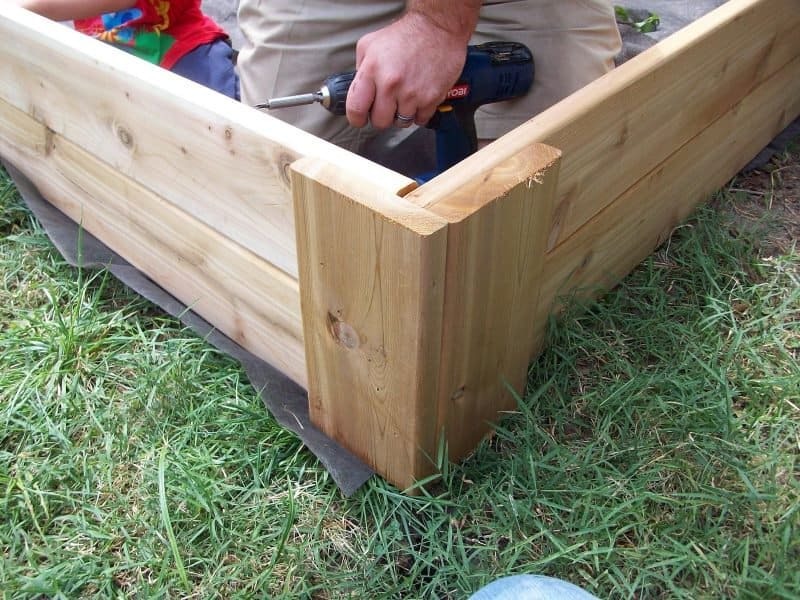 Cut enough slats to cover the top of the sandbox with minimal space between them. Next, measure the inside diameter of the sandbox, subtract an inch, and cut two 1′ x 4′ pieces of lumber to that length. Lay these pieces perpendicular to the slats covering the box and center them so that there is equal space on each side from the ends. Screw these pieces to the slats below with short screws- two per slat. Turn your cover over so that the two connecting pieces are underneath and not visible. Make sure that it fits snugly on top of the sandbox and mark where the support pieces are beneath. Attach two handles, each screwed in from the top so that they’re anchored into each support piece. You may be tempted to skip this step, but don’t! Keeping the sandbox covered will keep it free from bacteria, debris, and protect it from the rain. Of course, it will also protect it from the most dangerous predator-cats looking for a place to do their business. 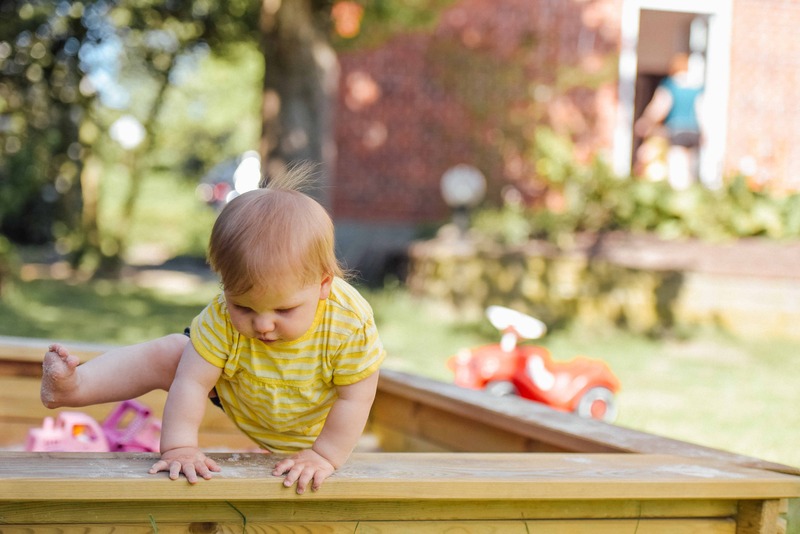 Painting the wood will make your kid’s sandbox look totally pro, and will protect it from the elements. Plus, you can let them decide on the colors so that it’s personalized. Spray paint is the most lasting option, but expect to use a few cans to cover the entire thing. While you don’t have to line the box, it will help you avoid any spillage over time. If you’re putting the box on an uneven surface, you may want to leave it unlined to allow some sand to spill through to help level it out. Yet, the lining also helps to prevent weeds and also allows for drainage so there’s no need for lawn repair if you decide to remove the sandbox when the children grow out of it. To line it, just cut two lengths of weed barrier so that they overlap and extend three inches onto the frame, and staple it in using a staple gun. Place your box in its final resting place, and make sure it’s exactly right before adding sand. Once it’s filled, it will be heavy. You may want to put it in an area that gets some shade during the hottest part of the day, or in the perimeter of your yard, so it doesn’t interfere with mowing. Once you’ve got it in place, fill ‘er up! Use play sand, available from your local hardware store. It should take around ten bags to fill a four by four box, but you may want to get a few extra. Step 9: Enjoy the Show! Kick back and relax while the kiddos use a plastic bucket & shovel, plus any recycled plastic containers to build, play, and create in their sandbox. Now your kids can enjoy hours of unstructured play in an environment that is extra-special because you made it yourself.